Most accidents that occur in homebuilt aircraft occur in the very early hours of flight. The builder/pilot often has a hard time getting sufficient time in the same model of aircraft that he is building to assure a safe first flight. Even though there are more RV's in the fleet than any other homebuilt, there are precious few instructors that are current and qualified to instruct in an RV. So what is the new RV pilot to do when he/she is ready to fly the new toy? Some builders will get an experienced RV pilot to make the first few flights, but this doesn't solve the transition problems for the builder. Other pilots will get some stick time in a friend's RV and attempt to get as familiar as possible with the RV handling traits. Others will (shutter!!) just jump into their new plane and launch, hoping that all will be well. Unfortunately, too many new RV's get wadded up due to under-qualified builders attempting to fly an aircraft that possesses flying traits that the builder is unprepared to handle. Much to Van's credit, an effort has been underway for some time to prepare builders for flying their new creations. 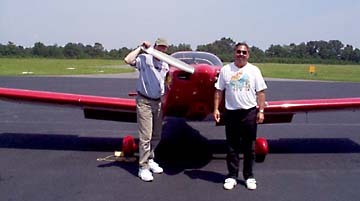 Mike Seager (shown at right) is an Oregon-based CFI who loves to fly an RV6 and introduce builders (and prospective builders!) to the delights of flying an RV. The factory leases the RV6 to Mike and provides support so he can spend several weeks a year in various areas of the country giving instruction in the -6. I caught up with Mike in Cartersville, Georgia, as he was making a swing through Tulsa, then Georgia, on his way to Oshkosh '99. RV-6 builder Kyle Boatright was gracious enough to invite me to his home airport to join his band of merrry pilots, and give me a chance to expose my piloting deficiencies to a very competent instructor! I scheduled two flights with Mike, and since the first flight was delayed due to ground fog, we discussed many topics related to RV's in general. Mike is well-connected to the factory with a good feel for the general state of the RV community and shared very encouraging and interesting details concerning the future of the RV fleet. I also enjoyed visiting with Ed, Mike's brother who was accompanying him to Oshkosh. The RV6 is more sluggish to rudder inputs on the ground roll than I anticipated. Mike keeps the tailwheel springs slack so students won't be as apt to get in over their heads on landings. However, my RV6 will have tighter springs so less pedal travel is necessary to keep the plane headed where I intend to go. This was the most powerful taildragger that I have flown. This resulted in more P-factor than I was accustomed to handling, and coupled with the slack springs I ended up behind the curve somewhat on take-offs. I also had trouble keeping my size 12's off the brakes during the take-off roll. So there I was, struggling to keep the nose straight as 160 eager ponies pulled us down the runway while I used the tips of my toes to prevent Mike from grabbing the controls and rescuing his plane! I am going to take another look at the brake pedal geometry on my plane to assure adequate clearance for my toes. Mike is a very patient and methodical fellow. We climbed to altitude as we made small-talk, then settled in for some basic airwork. Apparently the altimeter on Mike's plane needs some work because as I made a few 360's, the needle occasionally refused to stay as close to the assigned altitude as it should. He gently pointed out that while the RV6 is easy to fly, it is sorta difficult to fly precisely. This is one reason why the RV's are not the first choice for IFR flying. 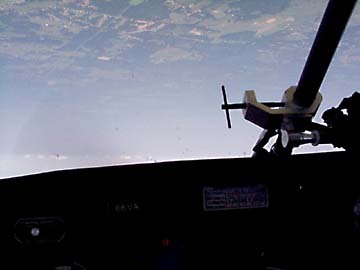 The rudder requires a pretty healthy shove at various times in the flight maneuvers to keep the little ball centered during slow flight. As we headed back to the airport for pattern work, I asked Mike to demonstrate some aileron rolls. He readily agreed and proceeded to first describe in detail the procedure we would be using. He raised the nose about thirty degrees, smoothly feed in full left stick as the horizon swung around and just kept going. Neutralizing the stick in 2-3 seconds had us flying upright again with the ground in the customary location. During the course of the roll, the nose dropped a few degrees below the horizon, and we maintained one positive G though the entire maneuver. I did detect the slight aileron buffeting during the rolls that I have read about previously. We also performed some approach and departure stalls (not at the same time...). The stall break was gentle with a little buffeting and recovery required only that back pressure be released on the stick. Indicated airspeed was about 58 mph. The departure stalls required a very aggressive nose-up attitude; I can't see how a pilot would get into the departure stall without having serious brain-fade (unless a very steep sustained pullup was attempted in the course of low-altitude shenanigans....then serious brain-fade would be obvious). Landings are what most students are really interested in mastering. Mike teaches a landing approach method that is different than what I have used in an RV6A, so some acclimation was necessary which never did totally gel during my time with Mike. 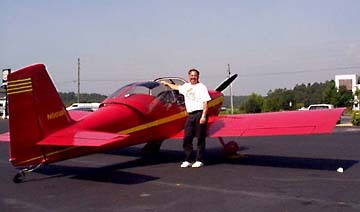 The approaches Mike advocate are very similar to the "old fashioned" method of setting up a high final and using a steep, full-flap, low-power yet fast glide to touchdown. The biggest problem I had was in finding the correct timing for the flair since the sight picture was different than what I was accustomed to seeing due to the steep approach angle. When questioned about this technique, Mike explained that he felt the high approach at 85 mph allowed a proper flair to landing without the student having to mess around with adjusting power settings during the flair. He may be correct, he does have over 3500 hrs in RV's after all, but I still need a little more time before I can master this technique. I still like to use very slight power adjustments to "feel" for the runway, but I dutifully attempted the landings using Mike's preferences. If the new RV pilot has problems adjusting to the RV landings, it will most likely be due to the RV's ability to retain a lot of elevator authority below stall speed. When I land a Warrior, a hefty pull on the yoke at stall speed just before the mains touch will merely soften the landing and hold the nosegear off the runway. Try this in an RV and you will either zoom back up or drag the tail! Consequently, my landings were either with a flair a couple of feet high, or were like a drunk trying desperately to feel his way to the runway as the nose of the poor RV6 slightly oscillated up and down. All my eight landings were safe, but none were very pretty. In spite of the less than perfect arrivals, I have no doubt I can safely get my RV6 back on the runway undamaged. Somehow, even though I had broken out into a serious sweat during the final landing, Mike remained dry. As is evident in the photo, he was still in a good mood even though I had inflicted various indignities on his aircraft. I extend many thanks to Mike Seager for a very instructive and enjoyable couple of flights. I think I can now safely solo N399SB, and maybe I can catch up with Mike for a biennial flight review someday. You can get in touch with Mike Seager, and get more info on this training program by hitting the training link on the Van's site.